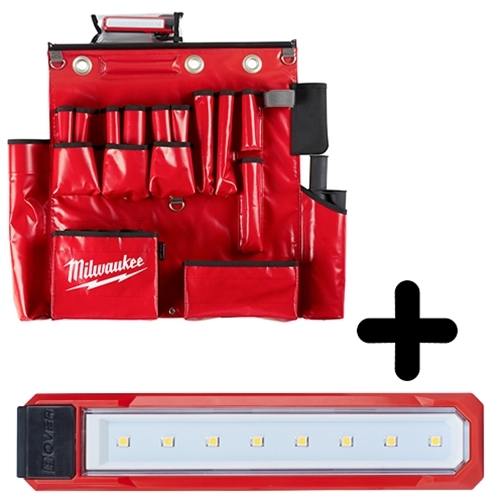 Milwaukee's Aerial Tool Apron provides redefined performance and lasting durability. The aerial tool board is designed specifically for our power utility and lineman trades. It features a multi-sized auger holder that won't burn through after extended job site use. The tool apron has 25 custom pockets including a dedicated flood light pocket, puncture resistant knife pockets, and magnets to hold sockets in place. The tool board is constructed with durable vinyl material and features 3 nickel plated brass eyelets. Built-in weep holes allow for water drainage in the pockets. Additionally, 3 D-rings are also included to give you additional storage. The aerial tool apron is designed for ultimate durability, giving you a complete and durable storage system specifically designed for the utility trades. Milwaukee Aerial Tool Apron has a rating of 4.8 star based on 5 reviews.